I’m one of those people who never really got the hang of browser bookmarking –my bookmark folder has always resembled a virtual version of the disorganized pile of papers on my desk. Excitedly catalogued finds would disappear into bookmark limbo (I’m sure we all know about bookmark limbo.) Then, along came bookmarking apps like Kippt, and visual bookmarking services like Fffound and WeHeartIt. A new rival, Pinterest seems to offer a strong solution in that it allows organizing, bookmarking, and sharing in neat and tidy bundles. Another problem I’ve had with bookmarking services (or could it be that the problem is with me? ), is that I’ll intend to share something and it will just never happen. A lot of it is to do with time constraints – saving, cataloguing and sharing cool pictures, memes and videos could easily become a full-time, unpaid “job” (of sorts). Pinterest solves this problem. On Pinterest? Follow My Social Agency here. The service works by letting you grab pictures of your favourite things as you browse online. These images (or videos) are then saved to your own pinboard. Looking through others’ pinboards and sharing content is all part of the fun. 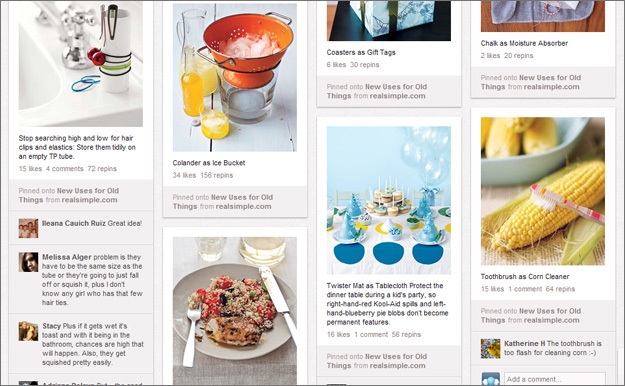 Pinterest is also handy for people who have images to collect for a specific purpose. For many artists and designers it could easily replace the physicalmood board, sketchbook, or scrapbook as there’s just so much more potential for collecting images. Brides-to-be and wedding planners create pinboards for inspiration, as do interior designers, both amateur and professional. Right now, Pinterest is invite only, and there’s quite a waiting list. The site has well and truly hit the high notes in social media, scoring amongst Time Magazine’s best 50 websites of 2011. In addition, in December, the site entered the top 10 social networks according to Hitwise data with 11 million total visits per week. This marks its status as something really new and important in the social web – a visually alluring contender to the more functional and text based micro-blogging services we all know and love. As such, the brands which are really making Pinterest work for them are, at this stage, cool home and lifestyle brands such as Whole Foods and Real Simple, and fashion brands such as Bergdorf Goodman. These highly visual brands make good use of the more intuitive and visually oriented interface which is better suited to them than is Twitter or even Facebook. For brands looking at social media marketing, Pinterest is somewhere with great potential for careful and creative self-promotion. As for me, I think I’ve finally achieved a state of bookmarking Zen.